This year’s Salmon in the Classroom season began in January 2018 when Whidbey Watershed Stewards identified a group of 5th Grade Salmon Ambassadors to join us on a field trip to the Wallace River Hatchery to pick up 250 salmon eggs! We divided the eggs between two aquatic tanks, one in the office at South Whidbey Middle School (Grades 5-8), and the other in the hallway at South Whidbey Elementary School (Grades K-4)! 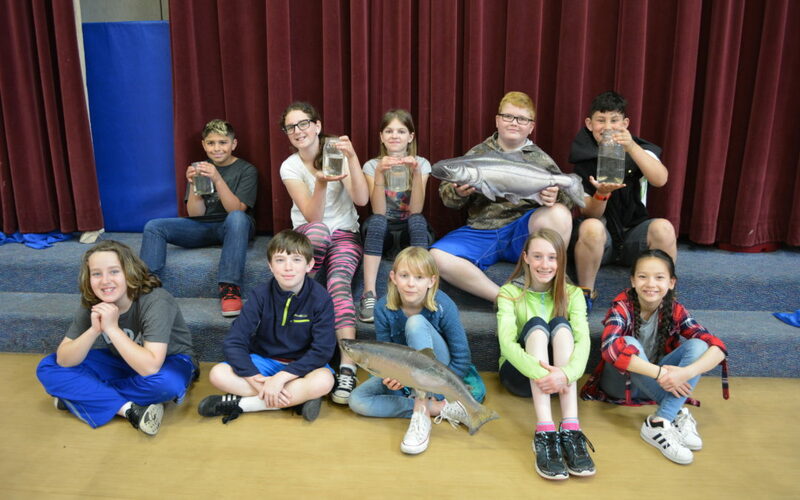 The 5th grade Salmon Ambassadors have been taught how to monitor and care for the juvenile salmon, tracking water temperature and other indicators of salmon development. Students from the 2017 fifth-grade class students released salmon fry into Maxwelton Creek on in April 24 as part of the Salmon in the Classroom project. The 2017 sponsor was Holmes Harbor Rod & Gun Club. Click to view a fun video of the salmon fry release on the South Whidbey Schools Foundation page! This entry was posted in Education and tagged highlighted on June 20, 2017 by Amy McInerney.